It's been a busy week so far, and I just finished putting a new build up on XBLIG for testers to check out the recent changes. One change I'm especially happy about is that all the craftable items in the game can finally be made using resources found in the world. No more debug features required! pickup items when a block is destroyed. * It is possible to create all blueprints using items found in the world. * Some tweaks to voxel textures. Please let me know if any voxel textures look like they need to be improved. Clay and Sand have been completely redone. 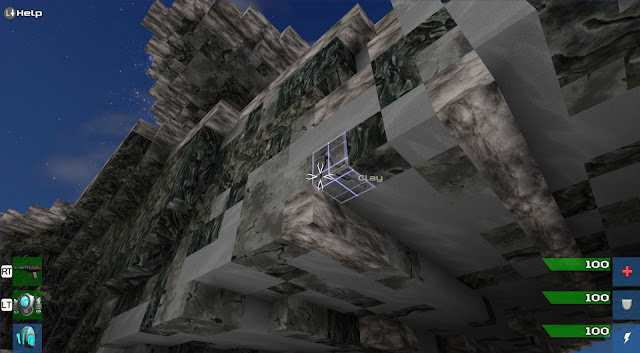 * Some block types can now emit light, including a few types found in the caves. * Caves are much more interesting to explore now as a result of generally improved lighting. * Player movement has had more tuning and should feel better. * Gravity has been reduced a fair amount. * NPCs are pursuing and attacking the player more reliably. * Jetpack particles tuned up a bit, and now has a light that is always on while wearing it. * Fog settings now transition to an underground state when down in the caves, helping with a problem where it would seem you were near the surface since you could see the sun & stars sometimes because chunks that should be blocking the sky weren't ready yet. * Renamed the game type "Explore" to "Survival". * Added game type "Explore" which is the same as Survival, without any aggressive NPCs. Kind of nice if you just want to wander about freely. * Targeting info for voxels now has proper names shown now, except for one rock type which I will be fixing. * The planet now has a molten core very, very deep underground. There is still no practical limit to how far down you can go if you want, but there isn't really a good reason to make it infinitely deep and reaching the core is a pretty fun accomplishment. If it seems too close to the surface, let me know I can put it at any depth. * Hoverbike is 50% faster. I will be making some changes to the main menus to better explain the differences between the different game types. I recommend checking out the socket system, in particular the Heat Exchanger and the Transformer items, both of which can be put into the pistol or atomizer. The transformer can be put in the Jetpack to increase energy recovery for longer flight times which makes cave navigation a lot more fun. It takes me about 10 minutes to harvest the necessary materials to craft these items.